Wikipedia identifies three types of stud finders: magnetic (which pick up metal fasteners in the studs or drywall), capacitative (which detect changes in the wall’s permittivity that typically reflect density), and radar-based. Magnetic stud finders are usually just little mechanical widgets with a magnet that “clicks” audibly when it rolls over a buried fastener. Capacitative stud finders are by far the most common these days, and if you ask for a stud finder at the hardware store, that’s probably what they’ll give you. And as far as I can tell, nobody is actually manufacturing radar-based stud finders yet. The Shinwa 78610 ($14.95 from Garrett-Wade) arguably represents a fourth type. It is entirely mechanical, requiring no batteries, and combines a classic magnetic “click” sensor with a spring-loaded pin, shielded by a graduated depth gauge, that physically probes the space behind the wall and confirms or denies the presence of a stud pretty much unequivocally. And unlike a capacitative stud finder, it will never have problems working through plaster, or foil insulation, or wire lath. The probe does leave a small hole in the drywall, but it is tiny—a spot of paint will fill it without any spackle at all. Plus, as a bonus feature that is (I think) unique to this type of stud finder, the depth gauge provides an accurate measurement of the thickness of the drywall. This can be a crucial bit of information when choosing fasteners, whether they’re screws going into the studs, or anchors going into the drywall. You can use the magnet to hunt around for metal fasteners as a starting point, or just start systematically probing with the pin. When you hit a stud, you’ll feel it, and you can read the drywall thickness off the scale. Once you’ve found the first stud, finding a second, adjacent stud is much easier, because you can probe at the common 16″ and 24″ stud spacings. And once you’ve found two adjacent studs, you know the distance between centers for sure, and you’re home free. 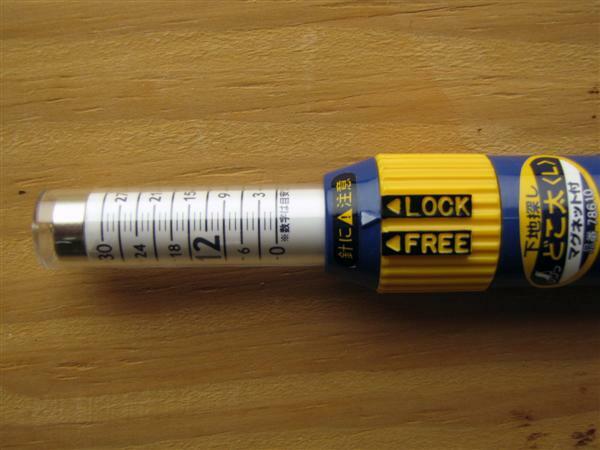 The tool breaks down by unscrewing in the middle, which allows for removal of the pin, in the tip, and/or for access to a store of replacement pins, in the handle. It ships with two replacement pins, and you can buy a set of 10 more from Garrett-Wade for another $8. I have no idea how long they last, since I’ve only owned the tool for a couple of weeks. The pin plunger has a rotary safety lock to keep the sharp end safely covered when not in use. There’s also a lanyard hole in the pommel in case you want to hang it up (which I always do). Overall, I like the Shinwa 78610. Even though I have a decent capacitative stud finder, I often seem to end up using a 1/16″ drill to probe for studs, anyway. And, if I’m looking for joists in the ceiling instead of studs in the wall, mechanical probing is pretty much my only option. The ceilings in my homes seem to have popcorn texture which prevents the use of any kind of instrument you have to slide across the surface. So for that use alone, I’m glad I’ve got the Shinwa in my toolbox and think it’s worth the $15. See our entire Toolbox category here.